It was a megawatt affair that brought together old friends and new foes, and stars from every firmament. The annual “People of the Year” awards Thursday night at the InterContinental in Makati City honored the best and the brightest of 2007, and those whose achievements inspired excellence in others. It was also a gathering of presidentiables and their running mates, with both likely and unlikely tandems being conceived as they rubbed elbows with each other. Aside from the awardees, also present were former President Joseph Estrada, Vice President Noli de Castro, Sen. Manuel “Mar” Roxas II, Sen. Jinggoy Estrada and Manila Mayor Alfredo Lim. The awardees were led by Sen. Loren Legarda, Batangas Gov. Vilma Santos-Recto, self-made billionaire Andrew Tan, Taguig City Mayor Freddie Tinga, Dolphy, Fr. James Reuter S.J., consumer advocate Pinky Pe Tobiano, entrepreneur Vivienne Tan, businessman Ted Haresco, civic leader Gina de Venecia and the Mt. Everest Women’s Team composed of Janet Belarmino, Carina Dayondon and Noelle Wenceslao – the first Filipino women to scale Mt. Everest and the first Southeast Asian women to reach the summit. Estrada, who is said to be ready to run for president anew in 2010 if the opposition is unable to field a single bet, sought out Fr. James Reuter S.J. and was overheard telling him, “Father, I am a free man now.”The former president spent some years at the Ateneo de Manila. The evening was also a reunion of sorts for Estrada and “the King of Comedy,” as Dolphy is more popularly known. The two embraced warmly. Dolphy has been wooed in the past to run for public office, and made popular the quote, “Madaling tumakbo, pero paano kung manalo (It is easy to run for office, but what if I win? )” “Concert King” Martin Nievera, balladeer Christian Bautista, the Angelos and jazz artist Olivia dazzled the A-List audience that filled the ballroom of the InterContinental during the awards program, which was emceed by Johnny Litton and Phoemela Baranda. 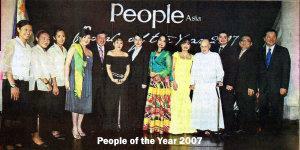 People Asia was founded in 2000 by the late STAR publisher Max Soliven. It is published by the Stargate Media Corp with Babe Romualdez as publisher, Kevin Belmonte as president and Ramon Cojuangco Jr. as chairman of the board. STAR editor-in-chief Isaac Belmonte, Soliven’s daughter Sara de Guzman, HSBC’s Suresh Nanoo and Chris Rourke, Universal Motor Corp.’s Elizabeth Lee, Qatar Airways’ Rohan Seneviratne, Dockers’ Bobbet Romualdo and the STAR’s Entertainment editor Ricky Lo also presented the awards to the winners. This entry was posted in ARTICLES and tagged ARTICLES, People Asia article: Brings Together Old Friends New Foes. Bookmark the permalink.